Almost certainly, Lelo inherited her love of horses from her grandmother and her mother, Betsey Reeves. She comes from a long history of women that have changed the world of horses. From the earliest age of 2, Lelo knew that horses would be her life, and she’s pursued her dream with inspiration and dedication. Lelo’s equine education started at home, Shepley Hill Farm, that was the site of many prominent horse events that featured Olympians and other equestrian champions. Fox Hunts and Pony Club shows were also held over the years at that location. Since that early age of two, Lelo has accomplished a great number of things, though at this point in her career, Lelo has chosen to focus more on the training of her students than on her own competitive aspirations. In her teaching, Lelo infuses her extensive knowledge of the basic balanced position with the necessity for effective riding. She trains students much the way she does horses, in a calm, clear manner in which there is always the opportunity to succeed. 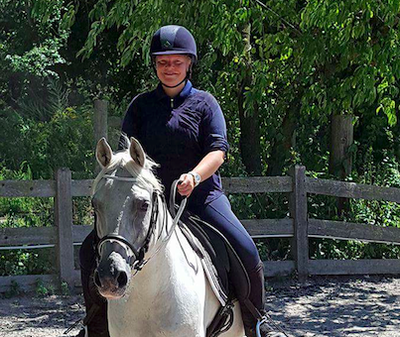 Lelo’s dedication to her students helps to precipitate their devotion to their own riding. She is often found bundled in wool coolers at the center of the arena in single digit weather, patiently explaining a concept to a student, waiting for tell-tale grin that so often accompanies the “ah-ha” moment during her lessons. These are the moments that she finds make all of the long hours more than worth it. In 1986 the property was sold. However, Lelo continued to run her equestrian business. However, in 2005 the property was sold again and her business found a new location. Today, She is the operator of Shepley Hill Eventing in Acton, MA. Shepley Hill Eventing is a top-notch training facility that allows Lelo to carry on the tradition that her Grandmother started over 75 years ago. She gives credit to her success as a rider and a horseman to the many years of quality training she has received at the hands of many top-level instructors she has had the great fortune of riding under. Kerrie comes from a hunt-seat background, having taught for a number of years. She enjoys working with horses and students to help them become confident in their skills. Her two horses, Trouble and Luna, are loved by many of our riders.